With their single-story construction and efficient use of space, there's a lot to love about ranch houses. However, one look at the popcorn ceilings and 70s-era paneling will tell you that there's also plenty to improve. Whether you're hoping to stay true to this iconic American architectural style or you want a complete overhaul, there are many great ways to update your ranch house for the 21st century. One of the biggest complaints of many homeowners is that ranch-style houses can feel dark and claustrophobic. There are several ways you can remedy this problem. Working in one room at a time, use paint to mark the seams of the paneling. This will make it easier for you to work quickly. Remove all the trim in the room, including the trim around the door, windows, and near the floor and ceiling. Use a pry bar to lift up on the paneling where it meets at the seams. The paneling is usually nailed to the wall studs, so it will take some effort to remove it. Discard each section of paneling. Examine the condition of the walls. Often, the paneling is nailed directly to the studs, and there's no wallboard behind it. If this is the case, you will need to hang drywall or hire a professional to complete this task. Prime the walls and paint them a light color. Replace the trim. For a quick fix, you can paint directly over dark paneling. An efficient way to counter the effect of a low ceiling is to add skylights. You can choose from a variety of different designs, including flat window-style skylights, tubes that extend through the attic insulation, and domed lights. Skylights come in many different sizes as well, and there's no right size for your home. What you choose will depend on your personal preference and renovation budget. This type of home improvement usually requires professional installation, but if you're handy, you may be able to do it yourself. If you take this project on, be sure to read all instructions that come with the skylight. Each type and installation situation requires a slightly different approach. 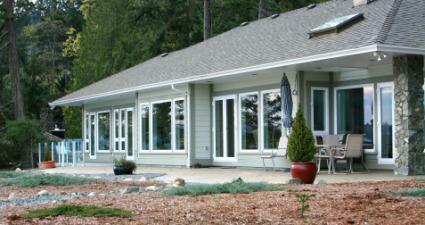 The typical ranch house features a large picture window in the living room and smaller windows throughout the house. Compared to other architectural styles, many ranch houses have fewer and smaller windows. Adding more windows or replacing your existing ones is a great way to bring more light into your home. Depending on the scale of your project and your experience level, this could be a do-it-yourself job. However, most people hire professionals to replace their windows. This is especially important if you'll be enlarging your windows or adding windows where there currently aren't any. The sections of your wall where you want to add light may be important structural supports, so always consult a professional before cutting into them. Remove dark carpeting and replace it with a lighter version. 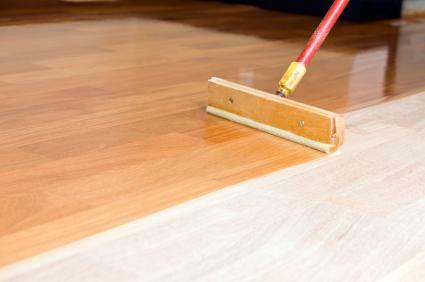 Refinish dark-stained wood floors and apply a lighter stain. Get rid of dark, dated vinyl flooring and replace with paler-colored tile. Before you begin, have a home inspector look at your ceiling. Many popcorn ceilings contained asbestos, so you'll need to have yours professionally removed if it has this cancer-causing material. If your ceiling doesn't have asbestos, you'll want to work on one room a time. The mess will make the room unusable during the removal process. Remove the furniture from the room, and cover the floor with plastic. Working on one small section at a time, saturate the popcorn ceiling with water. A spray bottle works well. Allow the water to soak in for several minutes. Use a wide scraper to remove the wet ceiling material. When all the popcorn material is removed, patch any uneven areas on the ceiling. Then repaint it a light color. With their low, long shape, ranch houses are designed to fit in with the wide open spaces of the prairie. However, this visual styles doesn't work quite as well in the suburbs. Try some of these ideas to help update your house's exterior. The right plantings can make your house appear taller. Plant fast-growing bushes near the corners of the house to soften the sharp angles. As they grow, the bushes will also provide some vertical interest. You can also add height by bringing tall trees to your yard. This may mean hiring someone to bring in trees with a tree spade. Mature trees will make your house seem taller. Ranch houses can seem narrow and cramped from the outside, but adding a porch can help. To do this, extend your roof out from the peak, and use pillars to support the extension. Pour a concrete patio or add a raised deck for the floor of the porch. Consider adding a short railing for visual interest as well. Due to the significant construction required as part of this renovation, it's best to hire a professional to help. You can get involved in the finish work, however. Replace black wrought iron railings with wood or composite alternatives. Remove window awnings and replace them with shutters. Exchange a dated front door for a modern version. Remove dated vertical trim and replace with overlapping shingles. Replace hollow core doors with paneled interior doors. Paint dark wood trim white. Replace brass or dull bronze cabinet hardware with contemporary alternatives. Remove existing light fixtures and replace them with new ones. Paint a dark brick fireplace to make it brighter. Before you begin your renovation, have a home inspector take a look at the house. Ensure all the major systems are in working order and that you're aware of any hazardous materials, such as lead paint and asbestos, that may be present in the home. Consider how much you want to change. Like other architectural styles of past eras, there's a certain charm to ranch homes. This simple design is rooted in the clean lines of mid-century modern style. Although there are plenty of updates that can improve the functionality of your home, you may want to think twice about those that change its soul. Be careful about over-improving. 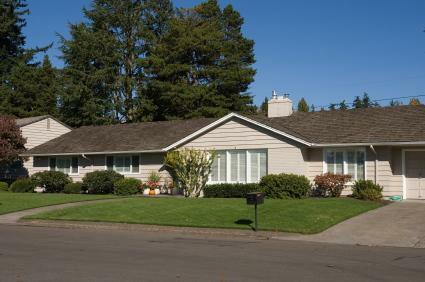 Since ranch houses are usually fairly small and are often located in middle class neighborhoods, it's a good idea to limit your renovations to ones that will bring some return on your investment. Replacing those orange laminate countertops is a good idea, but you might not need to go with granite. Don't forget about the basement. If you need more space, finishing the lower level may be much more cost effective than building a second story or adding on a room. Sometimes the dated surfaces and dark rooms can overshadow the qualities that make ranch-style homes great. Once you've completed your renovations, you'll be able to focus on the convenience of single-story living and the efficient layout of your home. At its best, renovating a ranch-style house brings new life to an old gem.